Rapid capacity expansion and a bulging order book for new tonnage are prominent features of the Handymax bulk carrier world fleet. Shipowners in many countries still show great interest in acquiring these vessels. This popularity is based on a perception that employment prospects are favourable, taking a longer term view. Handymax bulk carriers in the 40,000–65,000dwt (deadweight) tonnes capacity size group have very broad employment opportunities in a wide range of dry bulk commodity trades in most parts of the world. Their characteristics enable them to offer flexibility in the mode and pattern of sea transportation provided, ensuring lasting advantages. Reflecting these characteristics the Handymax fleet grew strongly, by over two-fifths in deadweight terms over the three years’ period up to the end of 2013. Although the pace of expansion has been decelerating it remains brisk, and substantial further enlargement is expected both in the current year as a whole and in future years. Handymax bulk carriers are predominantly geared vessels, with cranes and grabs for loading and discharging cargoes. Installed cargo-handling gear enables them to operate efficiently in trades where shore cargo-handling facilities are either unavailable or inadequate. Consequently, coupled with a size range acceptable in an extensive range of ports and berths, their employment pattern is extremely varied. In addition to use in the coal trades, grain and soya trades, and in some iron ore movements, they are used widely in minor bulk trades including steel products, minor ores and minerals and for carrying other industrial and agricultural commodities. Heavy investment in the sector, over recent years, has been encouraged by strong cargo volume growth performances in many trades, and prospects for further increases. During the period of three years up to end-2013, the Handymax fleet grew by 46.7m dwt or 42%, according to figures compiled by Clarksons Research. This addition raised fleet capacity to 157.8m dwt at the end of last year, comprising 2,990 ships. Over a five years’ period, including high annual percentage increments in the early part, expansion was an even more impressive 89%. Up-to-date statistics, showing the position at the beginning of October 2014, reveal that the world Handymax bulk carrier fleet consisted of 3,094 ships, with a capacity of 164.3m dwt. This sector total amounts to a vast carrying capacity, comprising just over one-fifth of the 750m dwt entire world bulk carrier fleet. As shown by the accompanying table, Handymax fleet deadweight growth has been vigorous but decelerating sharply in the past two years, amid declining newbuilding deliveries (following an earlier ordering slowdown), together with much higher scrapping of older tonnage. After surging sharply to a remarkable 20% increase in 2010, the pace slackened to an 18% rate in the next year before slowing further to 12% in 2012. During 2013 annual expansion was still brisk at more than 7% and, in the current year as a whole, a similar 6–7% increase is predicted. Deliveries of newbuilding Handymax vessels from world shipyards declined to under 15m dwt last year, after heavier annual volumes in the 19–22m dwt range during the previous three years. These additions were partly offset by scrapping, which rose to 4.7m dwt in 2012 before decreasing to 3.5m dwt in 2013. Demolition sales this year are expected to decline again, but the newbuildings total also probably will be down, the combined effect of which may be only a small change in the fleet’s percentage rate of expansion. There are now distinct signs suggesting that further deceleration in growth may not occur during the next twelve months at least. Handymax newbuilding deliveries could start rising again in the period ahead, because a very large volume of tonnage is on order at world shipyards. Scheduled deliveries for 2015 onwards have been mounting rapidly, due to an ordering spree over the past year or more. Contracts for new Handymaxes fell in 2011 and 2012. Then, last year, renewed interest amid mounting expectations that a freight market recovery was approaching, coupled with attractive prices quoted by many shipbuilding yards, caused these to surge to a new record high volume. The 2013 total of almost 29m dwt ordered was 56% above the volume placed in the preceding two years together. A further estimated 12m dwt was added in this year’s first eight months. Consequently the world orderbook is now massive. At the beginning of October 2014 according to Clarksons Research figures, 834 Handymaxes aggregating just over 50m dwt were on order, amounting to 30% of the existing world fleet in this size group. A comparison with the position twelve months earlier emphasizes how much the orderbook has expanded. The volume on order at the beginning of October 2013 was just over 32m dwt, representing 21% of existing tonnage at that time. This expansion of well over one-half in the overall Handymax orderbook will be reflected in actual newbuilding deliveries during the next couple of years. Scheduled orders for 2015 completion have now reached almost 22m dwt. The final figure could be swelled by late deliveries of ships originally scheduled for the current year. Even after deducting a large percentage to allow for orderbook slippage, a typical but variable feature and some specific postponements and perhaps a few cancellations, it seems clear that shipyard Handymax deliveries potentially could grow very substantially in the year ahead. Within the Handymax newbuilding orderbook, a high proportion comprises what are known as ‘Supramax’ ships exceeding 50,000dwt, and also the newer, larger ‘Ultramax’ sub- category of ships exceeding 60,000dwt. 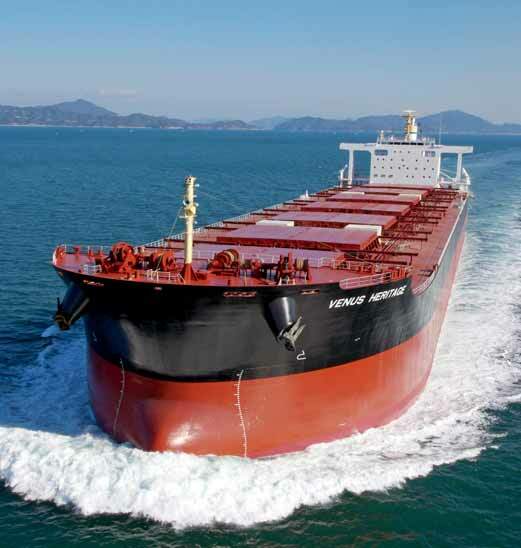 More than 90% of the entire Handymax order list now consists of vessels exceeding 50,000dwt. Last year the Handymax bulker sector’s statistical upper limit was raised from 60,000dwt to 65,000dwt, to accommodate the Ultramax ships sub-sector. A large number of these vessels will be delivered in the next few years. They are widely perceived as likely to have a valuable role in commodity trades increasingly requiring unit sizes with cargo handing gear and more capacity than the standard Supramax of around 52,000dwt. Their capacity is smaller than provided by the standard Panamax bulker of around 72,000dwt, usually a gearless vessel, and that distinction is also seen as valuable in many trades. The typical features of a Handymax bulk carrier make it widely employable within at least major parts of nearly all the global dry bulk commodity trades. Exclusions, normally, are mainly a large proportion of iron trade and a substantial proportion of coal trade, where much larger Capesize and also Panamax tonnage are the most economical unit types and sizes required. Coal trade is prominent among employment sources. In the past few years global trade in steam and coking coal has grown at varying but rapid rates, supplying more cargoes for Handymax ships as well as other bulk carrier sizes. This commodity forms the second largest seaborne trade only just below the largest, iron ore, and coal volumes are massive, reaching about 1.2 billion tonnes in 2013. Global seaborne coal trade has grown at rates of between 6.2% and 9.5% in the past three years, but the current year’s increase may be considerably slower. Much of the upwards trend in that period has been attributable to extra steam coal movements destined for power stations and other industries such as cement. Steam coal now comprises the greatest part, around three-quarters of the whole sector. The remainder, is coking coal trade related to the steel industry. Larger size ships mostly benefited from additional coal exports from some countries but, among trade routes extensively employing Supramaxes, shipments from Indonesia have been a particularly dynamic element. Indonesian coal exports reached 323mt (million tonnes) three years ago in 2011, and in that year overtook Australia’s volume to become the world’s largest supplier. Last year Indonesia’s total reached 381mt, a cumulative 91% rise in annual volumes over five years. Short-haul voyages to China represent a large part. However, growth seems to be fading and the 2014 total is expected to be flat or only slightly higher. Exports of low-quality lignite, a coal type not normally included in international coal trade statistics, has provided another boost in recent years. More variable Handymax employment is derived from grain (including soya) trade. This commodity’s contribution varies greatly both in terms of annual global volumes, and geographical trading patterns. In the past twelve months up to mid-2014, trade resumed growth with a notable surge, although that higher level is not expected to be maintained in the current period. Recent strength in grain and soya movements reflected higher import demand in many areas, coupled with improved availability in key exporting countries and lower prices on international markets. World trade in wheat plus corn and other coarse grains was 14% higher in crop year 2013/14 ending June 2014, at 307mt, according to International Grains Council estimates. Global soyabeans and meal trade in marketing year 2013/14 ending September 2014 was 11% higher at 167mt, based on calculations by the US Dept of Agriculture. Handymax grain trade employment opportunities over the past twelve months benefited from larger imports into African and Middle East countries, as well as into China, other Asian countries and the European Union. Soyabeans and meal shipments to China and the Asian region, the EU and elsewhere increased. During the year ahead, 2014/15, the upwards trend in soya movements is expected to continue with a moderate increase. But, conversely, wheat and coarse grains trade could weaken amid reduced purchases by China, the EU and several other countries. In the minor bulk trades group, some elements of which are actually very large and not really minor, there has been substantial enlargement in recent years. Much additional employment in these trades has been gained by Handymaxes. Annual overall volumes in this sector are estimated to have grown by approximately 17% cumulatively in the three years ending 2013, raising the total to a massive level just over 1.5 billion tonnes. Among key individual elements, steel products trade (coil, sheet, plate and other items) is a large employer of Handymax tonnage. Seaborne steel products trade figures compiled by Clarksons Research show the global annual total rising from 248mt in 2010, after recovering rapidly from the severe setback in the preceding year. During the past three years further growth to an estimated 288mt in 2013 occurred. Another rise of about 3% could follow this year. An extremely complex geographical pattern characterises steel trade, with many countries being simultaneously both substantial exporters and large importers. This feature reflects the hugely varied range of finished steel products grades available in various countries. Last year China exported 62mt and imported 15mt. South Korea exported 29mt and imported 19mt.The EU exported (to countries outside the area) 39mt and imported 31mt. These World Steel Association figures indicate the extent of two-way flows, generating massive demand for sea transport capacity and resulting in employment for Handymax and other bulk carriers. Within the Handymax size group, Ultramax bulk carriers have become the most desired vessel type for many shipowners. These ships have a carrying capacity at the top end of the statistical size range for Handymaxes: typically they provide 63-64,000 deadweight capacity. They are equipped with the standard cargo-handling gear of cranes and grabs, and the new designs also offer an attractive economic advantage when fuel costs are high, greater fuel efficiency. During the past couple of years, numerous Ultramaxes have been ordered, and newbuilding deliveries are increasing. World-wide orders for new Ultramax ships are estimated to have totalled 320 in 2013, a more than five-fold increase compared with the preceding year. The orderbook has been greatly augmented this year by additional contracts. A very large proportion of the total has been placed in Chinese shipbuilding yards, which have successfully marketed new standard designs. One of these standard products, the ‘Crown 63’ of 63,000dwt has attracted a substantial number of orders for the Chinese shipbuilder promoting it. Another design, the ‘Dolphin 64’ of 64,000dwt has proved even more popular, and ships of this type are on order at numerous Chinese yards. Perceptions of expanding cargo potential for Ultramax bulk carriers is a key element of the focus on these ships, as well as operating efficiency aspects. Over a very long period ahead, ports serving many commodity trades around the world will lack adequate shore-based cargo handling equipment for loading or discharging. Consequently ships offering this capability will continue to be required on a large scale, and there are multiple trades where the typical size of an individual cargo has been increasing. Until quite recently the supramax vessel of 52–57,000dwt was regarded as the most valuable sea transport unit for such requirements, but a ship able to load a higher cargo volume is now seen as widely employable. Commodity trades to Asian destinations, often intra-Asian trading, are a particular focus of attention. When cargoes of around 60,000 tonnes or more — often coal, ores and minor bulks — are lifted by gearless ships in the same size range as the new Ultramax vessels, a floating crane is needed at ports lacking facilities, significantly raising costs. This requirement partly explains why older, gearless Panamax bulkers which offer similar transportation capacity have become largely obsolete, combined with other disadvantageous features. The Ultramax can self-load from barges at an offshore transshipment terminal and then self-discharge at destination when necessary, in shorter haul trades within the Asian region and many other trades elsewhere. Together with the enhanced cargo size which can be accommodated, the potential benefits are clearly identifiable. This year the Handymax freight market has not been able to hold on to last year’s gains. In the final quarter of 2013, as illustrated by the Baltic Exchange Supramax Index, freight rates in this market sector strengthened sharply, resulting in an index level exceeding 1,500 points towards year-end. Improvement followed two quarters of low rates, when an index level during that period of well below 1,000 was seen, preceded by even lower levels earlier last year. The index is based on several timecharter trip rates for a standard 52,000dwt size bulk carrier with installed cranes and grabs. A downwards trend emerged in early 2014. During the northern hemisphere spring to autumn period following, the index level dropped below 1,000 again, sometimes a long way below, before signs of a possible slight hardening began. There is still great uncertainty about both timing and magnitude of any sustainable market upturn. In the global dry bulk freight market as a whole, surplus shipping capacity is still a prominent feature, affecting the Handymax sector as well as other vessel sizes. Much of the excess has been absorbed by vessel productivity deterioration, manifested in slow-steaming and other trading ‘inefficiencies’. Global seaborne trade expansion and demand for tonnage has been growing at a healthy pace in the past few years and that trend continues. But the supply of transport capacity in the fleet has exceeded, sometimes greatly exceeded, increasing ship demand, leading to a generally subdued dry bulk freight market. For more than 60 years, PEINER SMAG Lifting Technologies GmbH — PSLT for short — with its product, PEINER grabs, has stood for quality and customer satisfaction in the field of bulk goods handling. The wide range of products allows PSLT to provide the right answer to all customer requests in the field of geared bulk vessels. Owing to PSLT’s many decades of expertise in development and construction of grabs, its customers have put their trust in the company and relied on PEINER grabs, particularly in the difficult market situation of recent years. To further develop this expertise, the company makes above-average investments in the research and development of products. Thus new designs and alternative materials are continuously brought into serial production. The goal of PSLT is to continuously improve its products while taking into account the requirements of the market. At PSLT, the customer is always at the centre of attention. The size, shape and dead weight of grabs may vary and, therefore, be tailored in every respect to the needs of customers. PEINER grabs are adapted both for lifting devices and for each application to always find an optimal solution. PEINER dual scoop motor grabs can be suited to the technical parameters of any deck crane. In combination with PEINER deck crane power supplies accessories, PEINER grabs can be operated with any common deck crane. For geared bulkers without deck crane accessories, PSLT supplies PEINER deck arrangement towers. These towers are flexible and can be quickly readied for operation. Maintenance is kept to a minimum thanks to the use of high- quality materials such as HARDOX and WELDOX in combination with an optimized design. This keeps the life-cycle costs as low as possible. A modular design enables the use of standard parts in different grab models, which greatly simplifies the storage and results in faster response times in the production of new machines and after-sales management. Thanks to the intelligent design, it is also possible to match up high grab capacities with low dead weight. Apart from the quality of PEINER grabs, PSLT is notable for its global service and dealer network that offers the customer round- the-clock customer service. In addition to the assembly and start-up provided by its technicians, the company also provides training for the operating personnel. Thus PSLT’s customers get everything from one source. Of great importance in the entrepreneurial thinking are the issues of environmental protection and sustainability. Environmental protection does not begin only when the grab is finished. Both at the work preparation stage and in the production process, care is taken to reduce the impact on the environment. In addition, PSLT strives to keep the environmental impact associated with the use of grabs as small as possible. A number of features make it possible to minimize the loss of bulk materials. In addition to dust covers, these include special sealing systems on the side and bottom lips. The use of steel sealing strips, rubber-sealed lips, overlapping bottom and side lips or special side toothing prevents bulk materials from trickling down. In contrast to the competitors, PSLT’s four-rope dual scoop grabs are also designed with just one, rather than two scoop pivot points. This results in such movement of scoops that ensures a synchronous closing and excludes any offset between scoops.